The boundary between arctic tundra and subarctic forest is the largest vegetation transition (or ‘ecotone’) on the planet stretching > 13.000 km around the northern hemisphere. A warmer climate is expected to cause both an expansion of shrubs and trees into tundra areas, and intensified forest pest outbreaks, making it challenging to predict the future of the ecotone. Higher temperatures are beneficial for the growth of trees and tall shrubs, and dynamic climate-vegetation models predict that the northern distribution limits of woody vegetation types will change dramatically in the near future. Encroachment of shrubs and trees into tundra areas will alter the surface reflectance and hence have implications for climate feedbacks. Encroachment will further facilitate range expansions of boreal species such as the red fox into tundra areas, resulting in increased pressure on the critically endangered arctic fox. 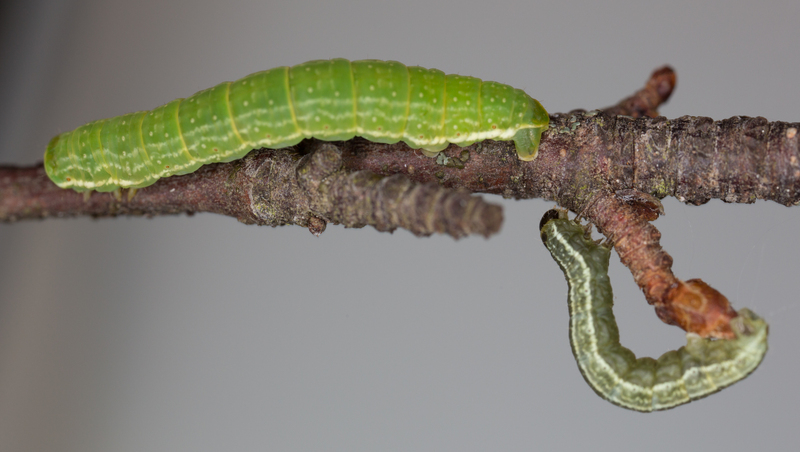 Outbreaks by insect pests are intensified by a milder climate, and in Varanger, moth outbreaks have resulted in historically unprecedented levels of forest mortality during the last decade. The regeneration of the forest after such outbreaks is strongly dependent on the browsing pressure from mammalian herbivores. It is therefore necessary to monitor biotic drivers of ecotone dynamics, in the form of ungulates and moth, in order to understand the indirect as well as the direct effects of climate change on the tundra-forest ecotone. Moth outbreaks are strongly cyclic with peaks approximately every decade. Outbreaks in Finnmark have historically been caused by the autumnal moth, but have been intensified by the expansion of the winter moth into the region. The long time series above (panel A) is from Troms County where moth monitoring has been in place since 1999. Moth monitoring in Finnmark County (Panel B) was initiated in 2015 as part of COAT. Climate change is expected to lead to warmer and longer growing seasons in the Arctic, and improved growing conditions for many woody species. The expected result is tree line advance and shrub encroachment into tundra areas. Such encroachment will be modified locally by herbivores such as reindeer and rodents, but even more so by insect outbreaks. Warmer springs and milder winters will be beneficial for the growth and survival of insect pests, and climatically intensified insect outbreaks are already causing widespread vegetation changes and forest mortality in the subarctic birch forest of Fennoscandia all the way to the low arctic tree line in Varanger. Expected direct and indirect effects of climate change on the tundra-forest ecotone in Varanger. The direct effect of climate promoting woody vegetation growth and encroachment, and the indirect effect acting via intensified defoliator outbreaks and forest mortality, are expected to be the two strongest pathways. We expect strong interactions in the effects of ungulates and moth outbreaks as drivers of ecotone dynamics. Note that there is a strong difference in the rate of change according to the two pathways. 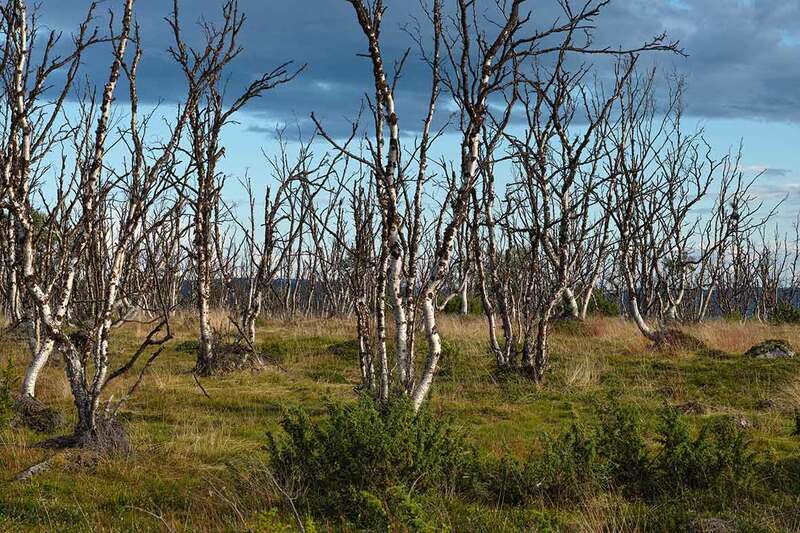 While insect outbreaks may cause widespread forest death in the course of a few years, temperature-mediated encroachment of shrubs and trees into tundra areas is a slow process acting on a scale of decades. 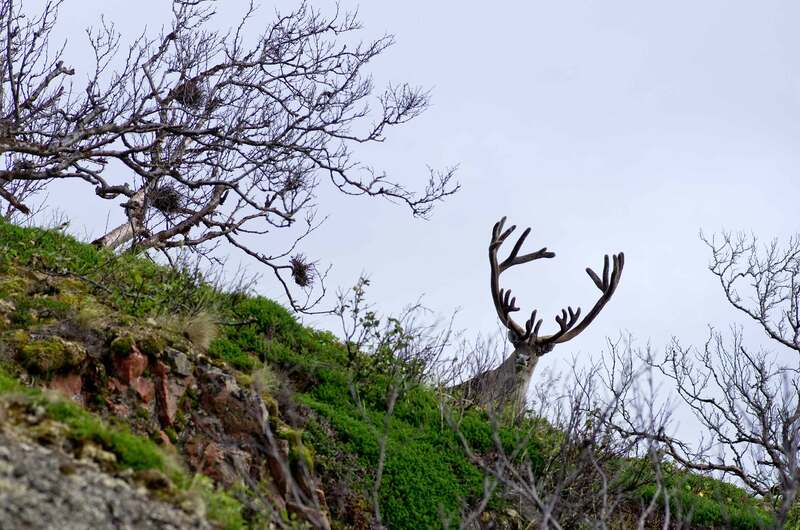 Ungulate (reindeer, moose, sheep) grazing and browsing can counteract the climate driven encroachment of trees and shrubs into tundra regions. At the same time, it can prevent the natural regeneration of forests after insect outbreaks. Information on the effects of ungulate grazing on woody vegetation growth under a range of circumstances is needed for management of both forest resources and ungulate densities. Salvage logging of forests may be an effective management tool for stimulating new growth in forest after insect outbreaks, but the benefits of logging may be highly variable depending on local conditions. 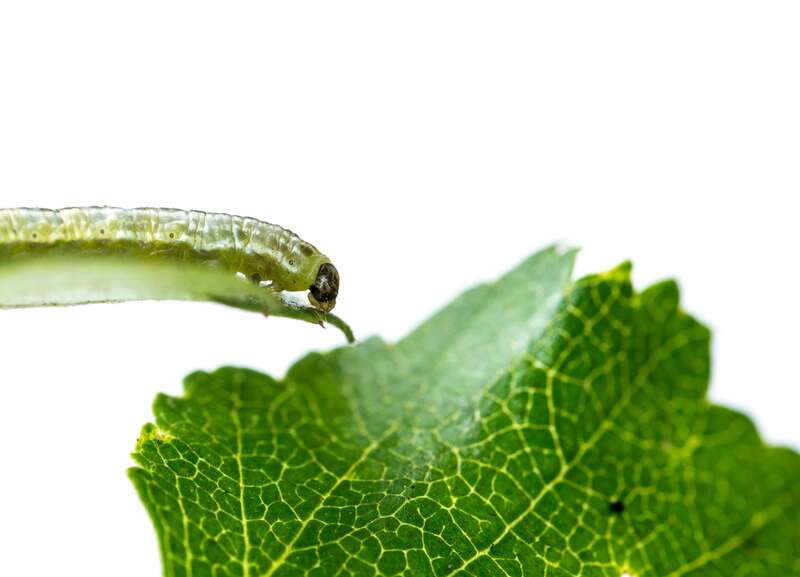 Documenting the effects of salvage logging in natural birch forests subject to moth outbreaks will hence permit forest managers to make more efficient use of salvage logging as a management tool in the future. Moth outbreaks: Annual field estimates of moth larval abundances in 4 lowland transects in Varanger since 2015. This will be expanded to also cover elevational gradients from lowland to tree line in the future. Annual remote sensing based mapping of forest canopy loss since 2000. Citizen science mapping campaigns of the invasive moth species scarce umber moth (Agriopis aurantiaria) in autumn since 2017. Forest health and regeneration: Experimental salvage logging since 2011 to document logging effects on forest regeneration. Experimental exclusion of ungulates and rodents from moth damaged forest since 2011 to document herbivory effects on regeneration. Regional scale surveys every 5 years to document forest health and succession following moth outbreaks. Ecotone dynamics: Surveys of tree line structure, tree age and recruitment events under different grazing and climatic regimes. Ecosystem effects of moth outbreaks: Abundance of mammalian herbivores based on pellet counts (rodents, ungulates), camera traps and GPS/satellite tags (ungulates). Flight intercept trapping of deadwood associated beetles in damaged and undamaged forest. Manual point counts and acoustic surveys of bird communities in damaged and undamaged forest. Vindstad, O.P.L., Jepsen, J.U., Ek, M., Pepi, A. & Ims, R.A.
Can novel pest outbreaks drive ecosystem transitions in northern-boreal birch forest? Vindstad, O.P.L., Jepsen, J.U., Klinghardt, M., Ek, M. & Ims, R.A.
2017. Forest Ecology and Management 405: 81-91. Vindstad, O.P.L., Jepsen, J.U. & Ims, R.A.
2015. . European Journal of Forest Research 134 (4): 725-736. Biuw, M., Jepsen J.U., Cohen, J., Markkola, A., Aikio, S., Ahonen, S., Wäli, P.R., Tejesvi, M., Vindstad, O.P.L., Niemelä, P. and Ims, R.A.
Jepsen, J.U., Biuw, M., Ims, R.A., Kapari, L., Schott, T., Vindstad, O.P.L., Hagen, S.B. Jepsen, J.U., Kapari, L., Hagen, S.B., Schott, T., Vindstad, O.P.L., Nilssen, A.C. & Ims, R.A.
2011. Global Change Biology 17: 2071-2083.